The identification of four DNA markers for feed efficiency has the potential to save the beef industry millions of dollars in feed costs over time by enabling the selection and breeding of animals that eat less without sacrificing growth performance. 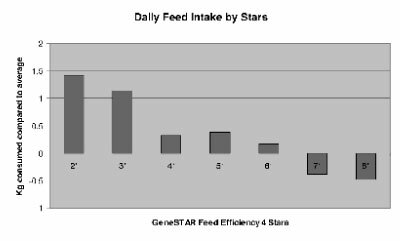 The GeneSTAR Feed Efficiency 4 test was released in October 2006 by Genetic Solutions and adds to the suite of tests already available for marbling and tenderness. The Feed Efficiency markers have highly significant associations with both net feed intake (NFI), which is the difference between an animal’s actual feed intake and its expected feed requirements for maintenance and growth, and feed conversion ratio (FCR), which is the amount of feed required to produce an average daily gain. "Seedstock breeders can use the test to select animals of high efficiency (low feed intake), and lotfeeders can use it to sort cattle for feed conversion efficiency," said Genetic Solutions sales and marketing manager Jason Strong. In a significant result for Brahmans, 86 percent of the Brahmans evaluated in a CRC for Cattle and Beef Quality trial showed 7 or 8 stars for feed efficiency (see Table 1), a frequency much higher than in other breeds tested. Mr Strong said more than 1470 steers and heifers from seven breeds were tested in the original database and the NFI measurements were taken during the final phase of grain-based finishing for different domestic and export markets. "Forty-six per cent of Brahmans showed seven stars and 40 per cent had eight stars and this compared to a much lower frequency of seven and eight stars in the British breeds," said Mr Strong. The impact from these results are significant in terms of profitability on both pasture and in the feedlot. "Animals with seven or eight stars would eat one kilo less feed daily in terms of NFI or the feed needed to produce the same weight gain as animals with three or less stars," said Mr Strong. 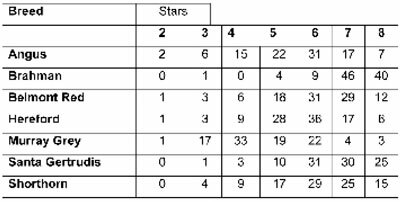 "The difference in daily feed intake between the two and eight star animals was more than 1.8kg of feed per day." The Feed Efficiency 4 markers will be particularly useful for seedstock breeders to produce more feed efficient progeny, and for lotfeeders who can use the test results to sort cattle with the best feed conversion ratios. "Lotfeeders can use the test to sort cattle for feed conversion ratio, as selecting cattle with five to eight stars would reduce the cost of gain in that pen. Done in combination with the GeneSTAR marbling tests, an opportunity exists to select cattle with higher meat quality at a lower cost of gain," said Mr Strong. Importantly, the new feed efficiency markers have no negative genetic associations to other traits such as average carcase weight, marbling and P8 (rump) fat. This is significant because lowering rump fat can reduce female reproductive performance, as well as resulting in less tender beef. Australian and Canadian researchers have also suggested that by selecting for NFI, reductions in the amount of methane and manure released into the environment could also be achieved.